Banff National Park is one of the world’s most incredible parks. Here you’ll find more than just jaw-dropping hiking trails and sapphire blue lakes... there’s also a thriving mountain town vibe to plug into. Banff itself is the highest Canadian town, towering at over 4,500 feet above sea level. There are loads of historic sites, museums, delicious places to eat, offering as much poutine as your heart desires. When you visit Banff National Park, you’ll be walking into history. Literally. This is Canada’s oldest national park, established way back in 1885. It’s surrounded by the Rocky Mountains and is home to glaciers, ice fields, forests, alpine meadows, and the brightest blue lakes you could ever imagine. 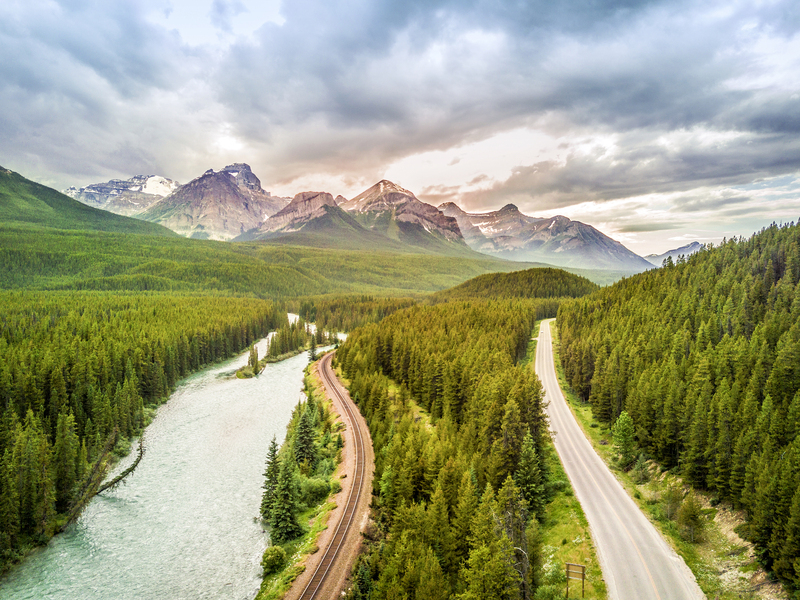 Banff is connected to Jasper National Park by the Icefields Parkway, an essential Canadian road trip in its own right. To the west of Banff you’ll find Yoho National Park, and to the south lies Kootenay National Park. At the park you’ll experience incredible mountaineering opportunities, a ridiculous amount of hiking trails, glacial lakes, and plenty of rad wildlife. There are grizzly bears, wolverines (yes, evidently they’re a real thing not just a superhero), elk, cougars, moose, and bighorn sheep! WHEN TO GO: Hiking season is at its peak from July through the middle of September. The snow here is insane. Some passes are still blocked due to snow even until late June, and if you plan to visit the park from October to June, avalanches on some of the mountain trails are no joke. It’s good to note though, that the park is actually open year-round. Summer will be its busiest season as far as visitors go, and fall is also a popular time for foliage-peeping. And ski season is November through May. WHAT TO BRING: Your hiking boots, obviously, and bear spray, 'cause there are seriously a lot of bears. Also, while on the subject of bears, always be alert and make noise while you’re hiking. Bears will stay away from you if they don’t think you’re trying to sneak up on them. And seriously, who wants a Revenant-type situation in such a beautiful National Park? Also, dress appropriately! Summers tend to be warm with not too much humidity to worry about, and daylight here can last until 11 pm! WHERE TO GO: Well, once you arrive at Banff it’s best to hit up one of the Visitor Centres to get up-to-date information on the hiking trails that are open, as some may be closed due to mud. Also, keep in mind that cell service is spotty at best. HOW TO GET THERE: Obviously you can drive to the park via the Trans-Canada 1. Or since the park is only 80 miles from Calgary, you could fly into the airport, rent a car and drive via Banff. There are also a few shuttle services and tour buses. In addition, if you’re headquartered in Banff, you could use the ROAM bus in town, which is a public shuttle bus. The Icefields Parkway connects Banff National Park at Lake Louise with Jasper, and it’s an absolutely essential Canadian road trip. In fact, it’s frequently referenced as one of the best drives in the entire world. So, if you’re in the area you definitely don’t want to miss out on this once-in-a-lifetime experience. The parkway itself is a 232 km, double-lane highway that takes you past gorgeous mountain valleys, and drop-dead gorgeous glacial lakes. A rather relaxing way to take in the scope of the park, and in particular Bow Valley, is from the comfort of the Banff Gondola. This 4-passenger gondola is encased in glass and provides a sweeping 360-degree view of not one, not two, but SIX mountain ranges! If you’re feeling adventurous head to the Banff Skywalk which takes you to the Cosmic Ray Station National Historic Site and Sanson’s Peak Meteorological Station. The rid is a short 8 minutes but it’s really a must-do. The Sulphur Mountain Cosmic Ray Station commemorates Canada’s study of cosmic rays, from 1957 to 1958. It’s a fun place to nerd out a little bit, and take in a pretty amazing view from the peak of Sulphur Mountain. After all that driving, why not hit up a hot spring?! The Banff Upper Hot Springs (and Radium Springs) are Canada’s highest elevation hot spring. The thermal water is propelled at a rate of 900 litres a minute through the earth via the Sulphur Mountain Thrust Fault and has been soothing weary travellers for over a century. Open year-round, from 10am-10 or 11pm, depending on the time of year, and the temperature ranges from 27°C/81°F to 47°C/116°F. For over a millennia, the entire area around Banff has been important to the area’s Indigenous peoples and is home to one of Canada’s most important historical sites, Cave and Basin National Historic Site is considered the “birthplace of Canada’s national parks.” Discovered in 1883 by railway workers, the Cave helped establish Banff National Park and is itself one of the largest protected areas in the entire world. Take a tour and explore the underground cave, and see first-hand the discovery that led to the creation of the Canadian park system. The busy season is from mid-May to mid-October. Take a breath and exhale. That’s what you’ll need to do to prepare yourself for the intense beauty of the Vermilion Lakes. Mount Rundle casts a dramatic reflection on these serene lakes and is best experienced at either sunset or sunrise. Seriously, this place is so pretty you’ll probably want to paint it, or write a poem about it or something. Located in the Bow Valley, these lakes are a perfect spot for a picnic, or you could rent a canoe or kayak, cycle, or a relaxed hike, surrounded by mountains. You can access the lakes from the town of Banff, it’s just a short drive. While you’re in the area, head over to Mistaya Canyon to experience a geological wonderland. It’s just off the Icefields Parkway, and there’s a parking area that allows for easy access to the short hike to the canyon. There are also plenty of signs along the highway indicated where to turn off for the canyon. You’ll want to visit in summer and fall because the trail is pretty icy the rest of the year. You’ve likely seen Peyto Lake if you’ve ever come across any travel boards on Pinterest, or scrolled through travel pics on Instagram. The glacier-fed lake is absolutely iconic. It’s in the shape of a wolf and is surrounded by mountains. It is quite literally one of the most beautiful lakes in the world. The colour of the lake is a breathtaking bright blue, due to the glacial rock flour that flows into it. The best place to view the lake is from the Bow Summit Lookout, just off the Icefields Parkway, along the Trans Canada Highway 1. There’s a parking area off the highway and just a 10-15 minute hike from there to the lookout. While we’re on a lake kick, you can’t visit Banff without seeing Lake Louise. Surprise, surprise, this is yet ANOTHER turquoise glacial lake, surrounded by snow-capped mountain peaks. But, if you’re thinking…well, you see one bright blue, glacial lake, surrounded by mountains you’ve seen them all…you would be mistaken! Located just off the Trans-Canada Highway, Lake Louise is drop-dead gorgeous in its own right. The trail around the lake will take you to the Lake Agnes Tea House, which is a great overlook, perfect for pictures. There’s a beautiful canoe dock for summer rowing, and in winter you can even skate on the frozen water. Named after one of the daughters of Queen Victoria, Lake Louise is 2.5 kilometres (1.5 miles) long and 90 metres (295 feet) deep. The lake is frozen for much of the year, but thaws in June. The best time to visit this popular lake is either before 9 am for an out-of-this-world sunrise, or after 7 pm, when the crowds have departed. The Plain of Six Glaciers Teahouse is the perfect place to refuel when visiting Lake Luise. Seriously, after a long hike around the lake, you’ll absolutely enjoy relaxing at the Chateau for an afternoon tea or venture into the woods, along the shore, and across a valley to the Plain of Six Glaciers Teahouse. Here you’ll find freshly baked goods, like scones, pies, and sandwiches, and obviously, tea. You can park near the Chateau, and then head to the Plain of the Six Glaciers trailhead from there. If you visit towards the end of fall you won’t have to deal with too many crowds, because this hike is actually very popular during the summer months. While we’re on the subject of tea…the Lake Agnes Tea House has been serving tea to weary wanderers since 1905. In fact, some would say these tea houses are keeping alive an especially significant Alberta Rocky Mountain tradition. Named after the first First Lady of Canada, wife to Canada’s first Prime Minister, Lady Agnes MacDonald once visited the lake that was aptly named after her and was blown away by its beauty. The Tea House today sits on a valley on the shores of Lake Agnes and is easily accessed on a short hike. If you’re hungry there’s usually homemade soup, sandwiches, and freshly-made bread. You can also hire horses if you visit here. Johnston Canyon is home to hiking trails, meadows, a lodge, waterfalls, and other geological goodies. The canyon is accessed just off the Bow Valley Parkway, and there’s plenty of parking. The waterfalls in Johnston Canyon are world-renowned and is probably one of the most visited waterfall trails in all of Canada. Be sure to wear comfortable hiking shoes, and if you want to avoid crowds plan to arrive super early in the morning, or do an evening hike. After all that outdoor exploration, you should plan to spend a little bit of time at one of Banff’s museums, to learn more about this special area. The Buffalo Nations Luxton Museum is a beautiful place to learn about the culture and traditions of the First Nations peoples. Here you can learn all about the area before European contact, and how the Indigenous groups in the area adapted to European colonists. Next, head over to the Banff Park Museum, where you’ll find an array of vintage taxidermy. As the oldest natural history museum in western Canada, the museum is perfectly located in the middle of the town of Banff. There are over 5,000 natural history artifacts and specimens to peruse. The museum itself is a work of art. It’s an early 20th-century log building that’s also the “oldest surviving federal building” in Canada’s park system. A few minutes walk from downtown Banff, you’ll find a secluded oasis…the Cascades of Time Gardens. This floral park features over 50,000 flowers, fountains ponds, stone paths, gazebos and best of all, it’s free to visit! Keep in mind, when planning a visit that the flowers are in bloom from June through September. When you imagine the most beautiful, historic mountain hotel, tucked into a valley that looks like it’s been ripped out of a Bob Ross painting…you still can’t visualize the stunning beauty of the Fairmont Banff Springs Hotel. This hotel is so special it’s been deemed a UNESCO World Heritage Site. Known affectionately as the “Castle in the Rockies”, this luxury hotel (originally built as a grand railway hotel) has been operating for over 125 years! And talk about location! Not only is it smack dab in the middle of Banff National Park, but it’s also above Bow Falls, and near some thermal springs. If you stay here, or even just visit, check out the painting of William Davidson, he was a Scottish colonialist who grew up near Banff in Scotland and became the first European settler to venture into the area. He was such an influential and inspirational pioneer that the area bears his name. If you’d prefer to stay somewhere a tad more rustic, the Tunnel Mountain Resort has a variety of accommodation options for every type of traveller. There are condos, cabins, and suites available, depending on your preference. There’s also an indoor pool, laundry facilities, and it’s located within the park itself. Did someone say fondue? Yes, please! The Grizzly House Restaurant has been in operation since 1967, offering mouth-watering, melted goodness to famished visitors and locals. You name it, they fondue it: Buffalo, Shark, Lobster, Chicken, Rattlesnake, and of course, Beef, Cheese, and Chocolate. The atmosphere is very Rocky Mountain rustic, with wood walls, totem poles, bearskin rugs, and taxidermy. The even have a bit of a quirky thing going on, featuring a mannequin on a motorcycle, and there are phones at every table (this is a remnant of when the place used to be a disco). Fuel up for adventure at the Whitebark Cafe. This Banff staple offers teas, coffees, house-made granola, fruit, yogurt, pastries, muffins, cookies, basically anything you need to start your day. Banff National Park has inspired countless writers, poets, painters, and wanderers from every walk of life. There really isn’t a bad time to visit, it just depends on what you want. Are you interested in a winter wonderland or a summer Alpine paradise? With over 1,000 miles (1,600 km) of trails, you can hike, cycle, or ride on horseback to explore this intensely beautiful park. Regardless of how long you visit, or what sights you see, you’re guaranteed to leave with the belief that Banff is magic.